May Mobility doesn't sell its shuttles to customers. Instead, it provides turnkey service and maintains control of the shuttles and fleet management — one aspect of the company, which has caught the attention of cities and investors. "Millennium has spent the past few years researching the mobility market, and May Mobility stands out to be the only company that has delivered a real-world, here-and-now transportation solution in a technologically feasible and economically viable manner," said Ray Cheng, partner at Millennium New Horizons. The company's self-driving systems, which include hardware and software, are installed on shuttles based on the Polaris GEM platform. A cloud-based repository gathers information on vehicle diagnostics, ridership trends and fleet location. Shuttles hold the potential to help solve the long-standing transportation challenge of connecting commuters with their final destinations — the so-called "first-mile, last-mile" problem. 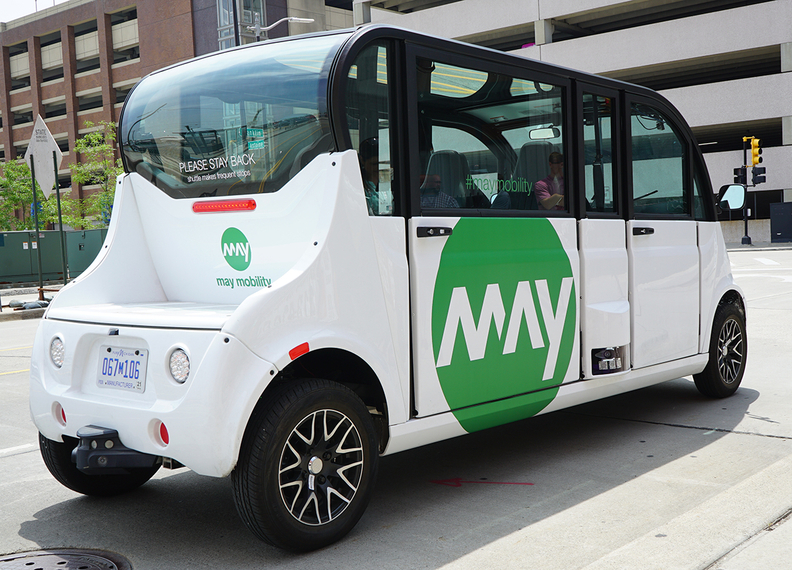 In Detroit, May Mobility's shuttles began providing a link between parking garages and the offices of Bedrock, the commercial real estate firm owned by Dan Gilbert. Rides in Providence are open to the public and free. The state is paying $800,000 for one year of service, according to the Providence Journal, $500,000 of which comes from the state's share of a settlement from Volkswagen regarding the company's cheating on emissions tests. There's not yet a time frame for starting service in Grand Rapids this summer. More sites for May Mobility deployments are expected to be announced this year.